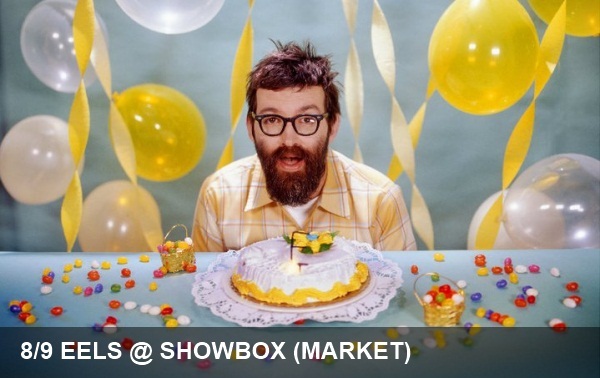 When the Eels were in town last year, frontman E, aka Mark Oliver Everett, gave us some great advice in a phone interview that bears repeating. The main thing that concertgoers need to understand is that we all got to work together to make it a great experience. All you have to do is have heard the end of Abbey Road to get the message. “The love you take is equal to the love you make.” That’s all you have to keep in mind when you come to any concert. You’re only cheating yourself if you’re not going to give something back to make the experience for everyone. The performers are going to play better and have more fun and put on a better show if they feel comfortable and if they like you. Now that the band’s back some ten months later, the same rules certainly apply. While Everett is almost a year out from the release of last summer’s beautiful, overtly positive Tomorrow Morning, the lessons he learned as part of the experience of making the record will no doubt carry over to another uplifting, performing-on-all-cylinders kind of evening. Speaking of upbeat… be sure to get there early to take in the infectious pop rock of The Submarines.